A cash machine, stolen in Co Antrim this morning, has been recovered by police. It is not known if the ATM recovered today contained any money. A digger was used in the robbery at a shop on Market Square in Bushmills. It is the ninth such robbery in Northern Ireland this year. On this occasion, the thieves used a stolen tractor to steal a low loader from a farmyard around three miles outside the town. They then travelled around half a mile across fields to steal a digger. It was then loaded onto the trailer and driven to the scene of the robbery. The cash machine was ripped from the wall of a shop and loaded into another vehicle. The digger and tractor were set on fire to destroy any potential forensic evidence. There have also been similar thefts in counties Monaghan and Cavan in recent months. 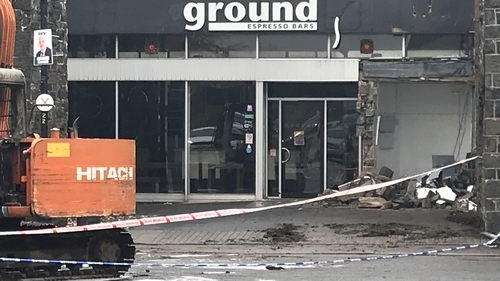 Detective Chief Inspector Dunny McCubbin said the ATM was now being examined as part of their investigation into the robbery and he appealed for anyone with any information to contact detectives in Coleraine. Meanwhile, a Co Donegal woman holidaying in the area with her family was staying in a youth hostel less than 100 yards from the scene. Mary Loughrey, from Rathmullen, said she was woken by a series of loud bangs shortly after 3am. "In all I heard about five bangs, I think wow it sounds like a JCB and a bucket," she told RTÉ News. "Then eventually I got back to sleep, woke this morning and was telling my sisters. I said that unless they were stealing an ATM last night I don't know what was going on here. And then this morning, it all happened." The PSNI says every available resource, including uniformed officers, detectives and undercover units in all policing districts across Northern Ireland are treating the capture of those responsible for these thefts as a priority. They are also working closely with gardaí.